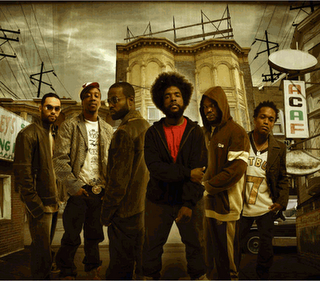 The Roots, hailing from Philly. My favorite group eva and for good reasons that I’ll get to in good time. From the moment I heard “You Got Me” as a sophomore in high school I knew I was hooked on the Roots and hip hop in general for life. I know that sounds redic and like the opening scene straight out of Brown Sugar (which both Questlove and Black Thought are in) but it’s true. For now, just know that I’ve got so much material on The Roots that they now have their own category and if you haven’t already bought/rocked/loved their latest album “How I Got Over” you’re slacking hard. This entry was posted in Music, Stuff I Think is Cool, The Roots Crew, Uncategorized and tagged Hip Hop, Music by shennajean. Bookmark the permalink.